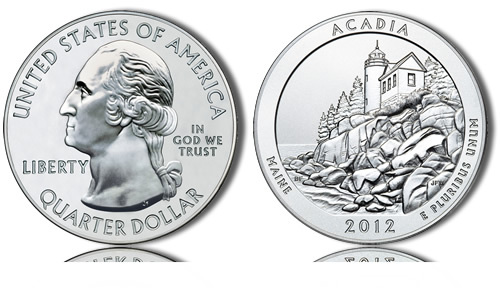 The 2012 Acadia National Park Silver Uncirculated Coins mark the third 2012 release of the US Mint’s America the Beautiful Five Ounce Uncirculated Coin Program. This specific strike in the series honors Acadia National Park of Maine and is struck from five ounces of .999 fine silver to a diameter of three inches. It was released for sale to the public on August 13, 2012. Coins in this series feature reverse designs emblematic of selected sites of national interest from around the United States and its territories. They are actually based on the designs found on the America the Beautiful Quarters® Program, also from the US Mint. As such, this five ounce silver uncirculated coin will actually showcase an obverse and reverse almost identical to that of the 2012 Acadia Quarter. Specifications-wise, however, these Acadia National Park Silver Uncirculated Coins are actually more similar to the Acadia Silver Bullion Coins, which also contain the same designs. However, both the five ounce silver uncirculated coins and the silver bullion coins are struck from the same five ounces of the precious metal and both have a diameter of three inches. Their differences lie in the fact that the uncirculated coins will be struck with more pressure typically resulting in more detail and are meant for collectors. This differs from the bullion strikes which will only have the bullion finish and are designed for investors. The Acadia Silver Uncirculated Coins are based on the corresponding quarter dollar, and thus feature a face value of twenty-five cents just like that quarter dollar. However, as each of these coins is composed of five ounces of the precious metal, there are two more values associated with each strike. The first is the melt value of the coin. Since each is composed of five ounces of .999 fine silver, they will always have an intrinsic melt value approximately equal to that amount of the precious metal on the open market. Second, and likely the highest value for these coins, each has a numismatic value associated with it. This numismatic value is based on what other collectors would be willing to pay to obtain the strike. It is likely that this value would increase based on the perceived rarity of the coin as well as its condition. "The reverse of the third quarter of 2012 depicts a view of the Bass Harbor Head Lighthouse and Acadia’s rough coastline. Inscriptions are ACADIA, MAINE, 2012 and E PLURIBUS UNUM. The reverse was designed by AIP Associate Designer Barbara Fox and sculpted by United States Mint Sculptor-Engraver Joseph Menna." Shown on the obverse of this coin and the other America the Beautiful Coins will be a portrait of George Washington, the first President of the United States. John Flanagan first completed this portrait for the 1932 circulating quarter dollar and it has appeared on the quarter dollar in one form or another ever since.